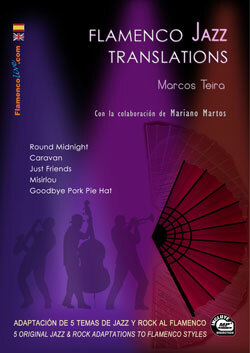 This work in Book/CD format, offers ideas about how to adapt jazz and rock tunes to a flamenco musical environment. It presents five pieces arranged and re-interpreted from a flamenco perspective. Of these pieces, four of them are jazz standards and one is a theme popularized within the rock context. It includes detailed explanations about the flamenco styles (“palos”), as well as other rhythmic, melodic, harmonic and formal elements of flamenco. It is a book/CD aimed at open-minded musicians who have drunk from the fountains of jazz, flamenco, or even of rock. Recorded with flamenco guitar, electric bass, cajón and flamenco clapping (palmas). Good for all harmonic, melodic or percussive instruments since each arrangement is recorded with the possibility if ‘mute’ included in a CD MP3 format.